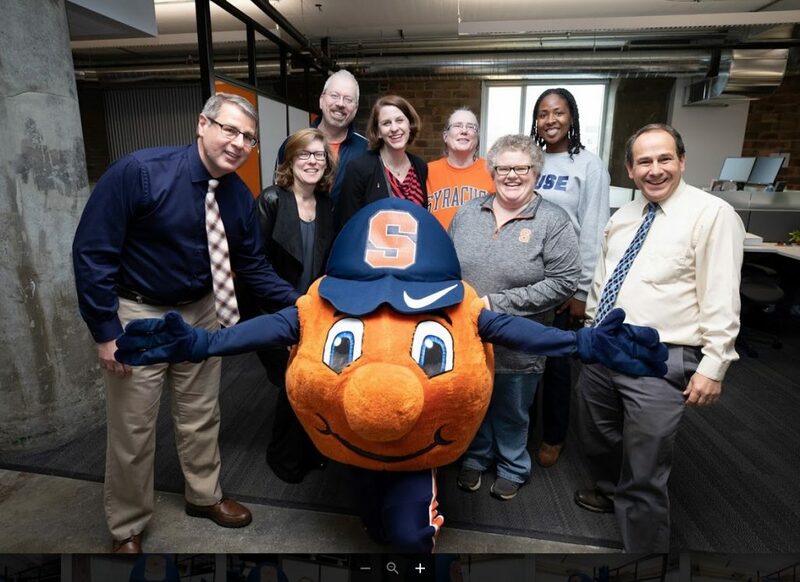 Otto visited the Division of Marketing and Communications staff this week at the Nancy Cantor Warehouse, spreading Orange cheer and taking plenty of photos. This week, 60 members of Syracuse University’s Division of Marketing and Communications relocated their offices off campus to the second floor of the Nancy Cantor Warehouse, located near Syracuse’s historic Armory Square. The move will help foster more collaboration and creative energy among the content creators, photographers, media relations experts, social media administrators and marketing team members. Relocating makes room on campus for student-centric and academic functions, a key principle outlined in the Campus Framework. It also further supports the University’s commitment to supporting and advancing the economic prosperity of the City of Syracuse and the greater Central New York community. The Warehouse space has been thoughtfully redesigned to accommodate the needs of a modern marketing and communications operation. Members of the division were surveyed last year in preparation for the move, and their suggestions were incorporated into the new space to create more efficiency, collaboration and team integration. The team collaborated with Campus Planning, Design and Construction; Parking and Transit Services; Human Resources; Facilities Management; and the City of Syracuse to manage the renovation and relocation. Formerly a storage warehouse for the Syracuse-based Dunk & Bright furniture company, the Warehouse was purchased and renovated by the University in 2005. It opened in 2006. The facility is named for the University’s 11th Chancellor, Nancy Cantor. In addition to the Marketing and Communications division, the Warehouse will continue to house the University’s Office of Community Engagement, the School of Design in the College of Visual and Performing Arts, the Sue & Leon Genet Gallery, Point of Contact Gallery and the Photography and Literacy Project.